GGW apologises to all its readers for the break in service the last few months while the Chief Editor, Sandy Jamieson has been obsessively finalising his work on his book “Yellow Submarine the miracle of Villarreal CF and a voyage in search of integrity, community and friendship in football”. The decision of Ringwood Publishing to defer publication of the book in order to ensure it covers the whole of season 2010-11 has been strongly vindicated by the astonishing success of Villarreal in the knock out rounds of the Europa League. In successive rounds, they have eliminated the second placed teams in Serie A and the Bundesliga, and the league leaders in Holland. Hopefully over the next 10 days they will eliminate Porto the champions of Portugal before meeting and beating the second best team in Portugal, Benfica, in the final in Dublin on the 18th May. The 18th May just happens to be the day of Saint Pasqual, Vila-real’s patron saint. So maybe it is written in the holy stars. But even if they are eliminated by Porto, this season’s achievements still add a Europa League semi-final to the list of Champions League semi-final and quarter final and UEFA Cup semi-final and quarter final places already achieved by this amazing little club in the last 7 years. In addition season 2010-11 should also see Villarreal qualify once more for the Champions League for season 2011-12. So the last two chapters of the book are not yet written and hopefully will not be finallycompleted until the 19th May with both the Europa League and the Champions League qualification in the bag. In that case the cover will be altered to show both Fernando Roig and Santi Cazorla holding up Villarreal’s first ever trophy. “Yellow Submarine” is essential reading for all football fans who believe that integrity, community and friendship can and should matter even at the highest levels in modern football. The explanation of how a wee club from a small town of 50,000 inhabitants became a major force not just in Spain but in Europe, including becoming Semi-Finalists in the Champions League, the UEFA Cup and the Europa League, and Runners Up in La Liga. The amazing success of Villarreal offers supporters of clubs both large and small throughout Europe a model of how they too might live the dream, without having to rely on Russian or American billionaires or Arab dynasties. The heart-warming story that explains how an invasion of Vila-real by 10,000 Celtic supporters in 2004 created a set of circumstances that has led to a lasting friendship between supporters of Villarreal and Celtic that is unique in world football and which still offers a model of camaraderie and togetherness that shows how football can be a force for good. Explanations of the Miracle “Yellow Submarine” will be of considerable interest to all lovers of football who have struggled to understand how a small club from a town of under 50,000 inhabitants has established itself as one of the most successful clubs in Europe. In the past 8 seasons Villarreal have been semi finalists and quarter finalists in the Champions League; semi-finalists and quarter-finalists in the UEFA Cup; and semi finalists in the Europa League, while establishing themselves as one of the Big Six clubs in Spain. It is also a story of amazing community involvement in a football club, with the number of season tickets holders representing over 40% of the population, a figure unprecedented in world football. Villarreal have by far the highest percentage of female season ticket holders, some 30%, of any major club. The Villarreal youth section has 7,000 members. In the Villarreal crowds, adult males are a minority. will also appeal to all those interested in the power of decency, integrity and friendship to make a positive difference in a complex world through football. Celtic supporters everywhere can rightly take pride in the story told in Book 2 as to how their example of camaraderie and good behaviour in 2004 inspired the formation of the Villarreal Celtic Submari which has proved to be an extraordinary example of the way in which decent people can help others through football and friendship. Book 2 also explores why the subsequent visit of Glasgow Rangers to Villarreal did not result in a similar outburst of mutual friendship. Book 2 provides a unique and never previously published explanation of the cultural and other differences between Celtic and Rangers supporters that explains their radically different behaviours abroad. It offers an enhanced understanding of some of the elements of the sectarian sourness that so scars Scottish football and suggests radical solutions drawing on the Villarreal model. “Yellow Submarine” will have a cover price of £14.99, a remarkable price for a collection of three books in one. However Ringwood Publishing is making a prepublication offer to reserve signed copies of the book to be delivered in advance of official publication for the exceptional price of £12. 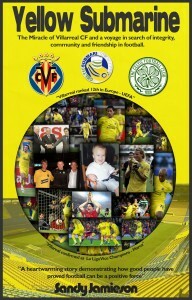 I can’t wait to get my copy…ENDAVANT VILLARREAL, ENDAVANT CELTIC!